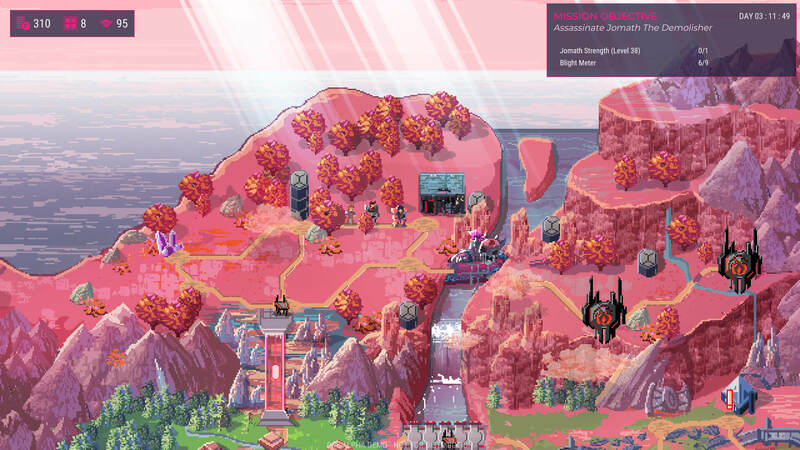 Star Renegades developers Massive Damage have not been resting on their laurels in the wake of Halcyon 6; in fact, they have been hard at work on a stunning-looking, RPG, roguelike adventure set in a sci-fi dictatorship, in a time and place far from here. Unlike Halcyon 6’s base-building core, Star Renegades has its combat and the build up to it at its core. Wonderfully animated pixel art engaged in turn-based combat is where you need to, or will be, spending a lot of your time. Thankfully, then, the build I was lucky enough to play a little of while at Gamescom earlier in the year was already robust and tightly wound — it’s definitely hard and I saw plenty of people wipe, possibly from expecting an easier ride due to the colourful palette the game has. Combat feels thick and fast, with room for half a dozen heroes on your side of the battlefield. Characters are specialised through their equipment, with weapons and armour defining moves, giving ample room for customisation to your party’s style. You need to keep mixing things up, however — enemies don’t pull their punches, so you’ll definitely want to dabble in support roles. Luckily, Star Renegades’ combat scenes features a Grandia-style ‘intent’ bar, meaning you can see — and adapt to — when enemies are winding up for a big attack. This, combined with there being no RNG (every attack hits unless blocked or dodged), results in a combat system based around building knowledge of skills and attack patterns rather than luck and timing. It’s not all combat, though. There is an overworld map which offers up areas to move between, each potentially triggering combat, trading or story-moment encounters. The overworld map I saw in the demo looked amazing, and I hope they continue to add more variety to it at that level of detail for the full version of the game. If your band of rebels do manage to succeed in reclaiming their land from the Imperium, they win twenty years of peace and a decent retirement for the least squishy of your heroes. While Star Renegades is definitely coming together very well, there are still new elements being added to the game. A defined campaign, or at least several structured parts, is being contemplated. The beginnings of character leveling and a camaraderie system (as in Disgaea or Fire Emblem) have recently been implemented to encourage clever battle placement for bonus attacks. There’s also a lot more to learn about its ‘Intelligent Adversary’ system, which eludes to evolving, adapting and learning boss enemies. Star Renegades is expected to launch in early 2019 for PC, Mac and Linux.